This week Skinnywench over at A Word in Your Ear has selected ‘celebration’ as the word of the week. Follow the marigold petals and you’ll find the dead. It’s early November in Oaxaca, Mexico, and the city and surrounding countryside are draped in flowers in preparation for the Day of the Dead. It sounds mournful, even somewhat ominous, but the atmosphere here is more jovial than funereal. Although it is often collectively referred to as Dia de los Muertos, which is on the second of November, the festival also incorporates Día de los Inocentes – for infants and children – on November first. It is believed that on these days the souls of the departed may visit and communicate with those they left behind, and an elaborate welcome is prepared for them. Cemeteries fill with families who bend over graves, removing fallen leaves, clearing weeds, dipping brushes into buckets to scrub grave sites clean. When that is done, the area is festooned with flowers, often orange marigolds. To make it easier for the souls to find their way, paths are often outlined with marigold petals, and looking down on a cemetery from above reveals a quilted patchwork of yellows, oranges and reds, with arteries of floral trails winding throughout. 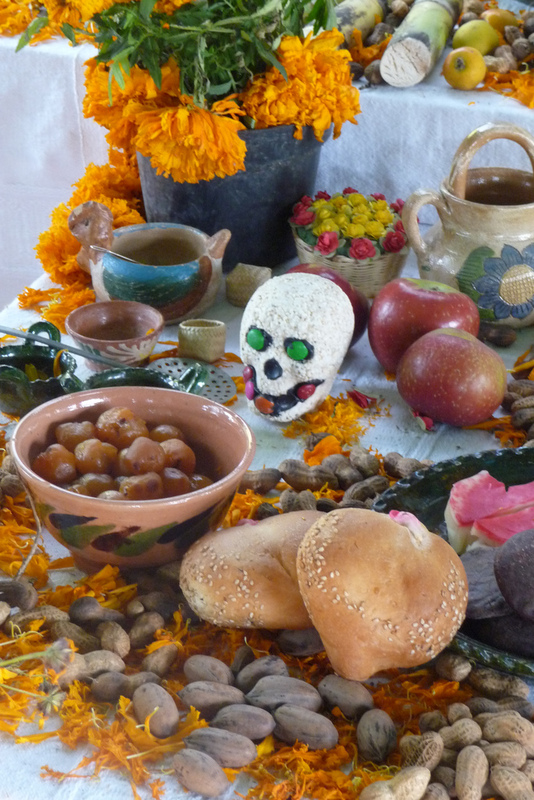 As the dead here do not lose their taste for worldly pleasures, offrendas (offerings) include the deceased’s favorite foods and beverages – morsels of candy, nuts, fruit, tamales and, commonly, tequila or its rather rougher country cousin, mezcal. 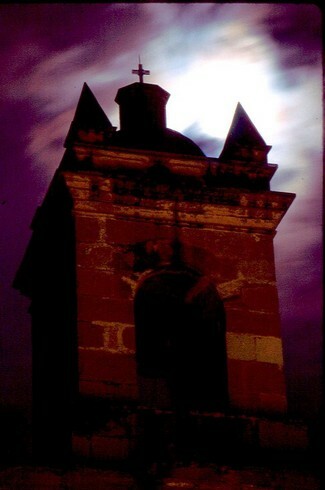 Wandering through a Oaxaca cemetery in the bluish glow of twilight, you may linger at a particular grave that has caught your eye to ponder its offrendas, perhaps speculate on the tastes and temperament of the resident. Innumerable candles and lanterns glimmer among the graves, casting shifting shadows, and for a moment it seems that the objects themselves flicker with an inner vitality. You approach up the petal-strewn path, the penetrating scent of crushed blossoms rising underfoot. Three bottles of inexpensive mezcal tilt drunkenly against a platter heaped with tamales, salty-sour roasted grasshoppers called chapulines, a bowl of chicken bathed in chili-chocolate mole sauce, several avocados, twin mangoes. Apparently something of a gourmand, definitely a drinker. A couple of books whose titles you can’t make out lean against the tombstone, and next to them are propped family photographs. A young father, mustachioed, hair swept back from a broad face, staring soberly straight into the camera lens as his wife bows her head to look at the child in her arms. A later family portrait, now with two boys and a girl, and he is looking more relaxed, almost weary. A day at a lake, the action frozen as he tosses the boy, arms and legs flailing, off of a dock. A last one, seated somewhat stiffly in a chair, fleshier in the face and chin, looking up from a book as though caught unawares. It seems an average, unassuming life, but one made somehow extraordinary by the care taken to preserve the memory of it. Next door to this grave your reveries take a heartbreaking turn. It is the much smaller tomb of a child, dead before the age of two, the father’s son. It is also draped in colorful blooms, but the offrendas here are wrenching. No photographs, no food, just a few simple items. A plastic toy truck, some tiny toy animals, a child’s drinking cup, empty, a couple of colorful plastic cars. Gone is the sense of playful reference to the dead; in its place an emptiness, a loss outlined in throwaway playthings. We leave the cemetery along with a tide of people that seems with each wave to be by turns carefree and desolate, cheery and sedate. The long walk to the center of the city becomes more and more congested with the flow, and by the time we cross Via Independencia and wade into the crowd in front of the Cathedral of Oaxaca, all pretense of solemnity washes away. The city’s central square – the zocalo – throbs with life: cafes spill out onto the square where boisterous patrons sip cold beer; vendors vie for the attentions of passersby, crying out their wares; three-meter phallic balloons shoot up into the deepening night sky; groups of guitar-strumming men swoop and swell the rhythm of the night. The almost sickly-sweet scent of gardenias wafts from the baskets on the heads of the women selling bouquets, and I am reminded of the scene from ‘A Streetcar Named Desire.’ Blanche Dubois is losing her grip on reality – past and present, fantasy and illusion commingle chaotically – and a flower seller is heard offstage – ‘Flores, flores para los muertos’ – flowers, flowers for the dead. But here there are no streetcars named Cemeteries or Desire, so we thread our way up Via Alcala towards the church of Santo Domingo de Guzman, past prostrate skeletons, whirling groups of youths passing dwindling mezcal bottles, vendors with carvings of skulls macabre, skulls jubilant, besotted skulls and skulls in sunbonnets. On one side of the looming, monolithic church a play is just beginning on the grassy lawn. The moon briefly peeks through just above the towering church spire, then is shredded by the long fingers of passing clouds. 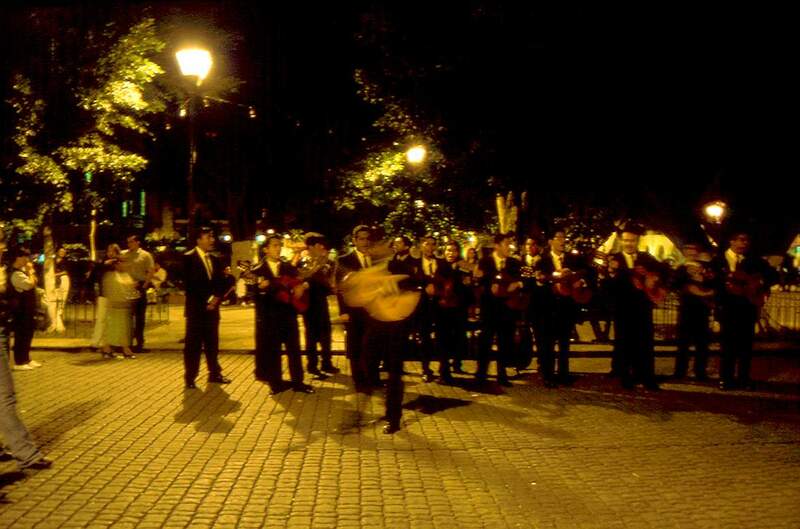 The origins of the Day of the Dead may be dimly found in indigenous rituals, particularly an Aztec observance for a goddess tongue-twistingly called Mictecacihuatl, but the story reenacted tonight takes place in the more recent past, as a small village is overrun in the night by the dead rising to relive the pleasures and passions of their former lives. They rise from their graves to the menacing pulse of a drum. It is difficult to follow, but it seems that the story revolves around two young lovers torn unfairly asunder, who once a year – on this night – are able to reunite and live out the passions denied them in life. There are still the families, however, and a particularly putrescent-looking male rival, who tries to prevent them, even in death, from consummating the passionate desires so unfairly denied. There is music, dancing, the tentative longing of love, there are the missteps, jealousies and foibles of those who really should, after a lifetime of experience and an afterlife of reflection, know better. The music swells, the dancing grows furious. The feud escalates and seems to become dangerously violent, and the dead shriek and howl in ecstasy and anger, menace and maniacal joy. There is an element of catharsis in the frenzy, and it is suddenly striking that this scene embodies Day of the Dead in its entirety. There is a duality here, a dichotomy between the more sober, solemn dedication to the memory of lost family and friends, and the playful, almost flippant celebration of their lives. It is very much like a New Orleans jazz funeral, in which the mournful mood and music are slowly interwoven with threads of increasingly upbeat, buoyant tunes until what is left is a joyous fete in honor of those who inevitably brought both delight and displeasure, as we all assuredly do. After the tumult reaches its climax and the desperate lovers are exiled from each other for another year, the dead tiredly, gratefully return to their graves, and pull the lids back over the darkening coffins. 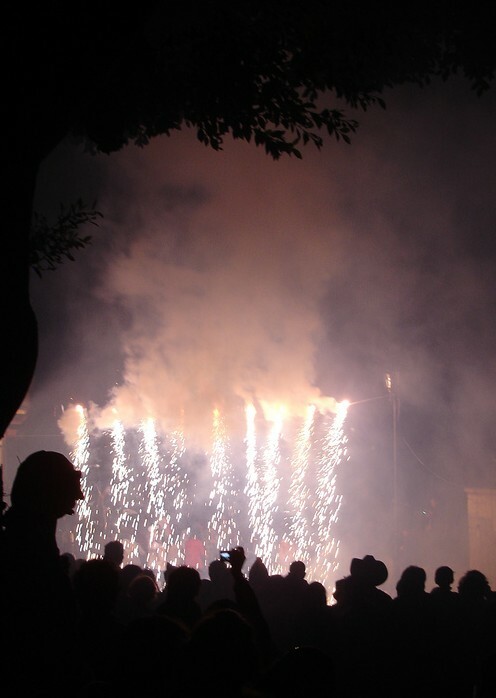 A white waterfall of fireworks cascades over the south wall of Santo Domingo, briefly bathing the scene in radiating waves of light, then darkness drops again like the wings of a giant bat, and the crowd ebbs away, back into the world of the living. This article first appeared on the website 2Camels.com. Fascinating! And richly told. There is so much to take in here. I love the first sentence. I happened upon the children’s section in a beautiful cemetery in Amsterdam. The sight of colourful toys highlighted the grief settled about the place. Thanks, Cuttlefish. Mexican cemeteries are very moving places and Day of the Dead is a holiday ripe for rich description – as you say, there’s so much to take in. It is cool, though, that they celebrate a day just for the death of small ones. We in the US don’t have many grieving rituals, and they are so important to those left behind. And to the dead as well, I’ll wager …. Hats off to you, sir. Great post. Thanks, restlessjo! I had a quick look at your blog – great stuff. Look forward to seeing more of it. Cheers! One of the best articles I’ve read in a long time about the Day of the Dead – just the right mix of info, emotion and pix highlighting your lyrical text. Thanks, ideflex! Really very kind remarks. Cheers! These pictures are fantastic! I’m glad you brought up New Orleans Jazz funerals. There’s something so powerful and surreal about them to me. They scare me a little, like cars driving during the day with their lights on for a funeral procession. There’s just something ‘off’ that signifies death. 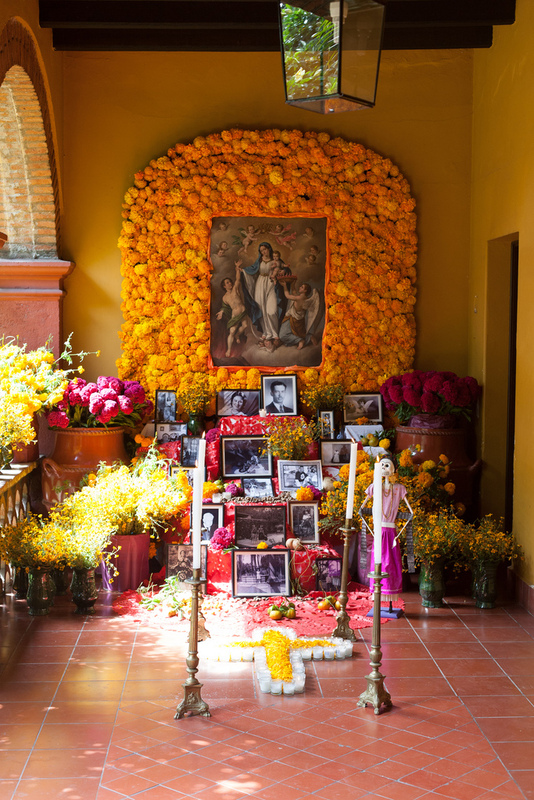 Wow, what a wonderful post, thank you for giving us some intimate detail of this important Mexican tradition, which brought it to life so vividly, especially the stories of the two graves. Love the photos, especially of the couple dressed up in their costumes and the gossipping dead. 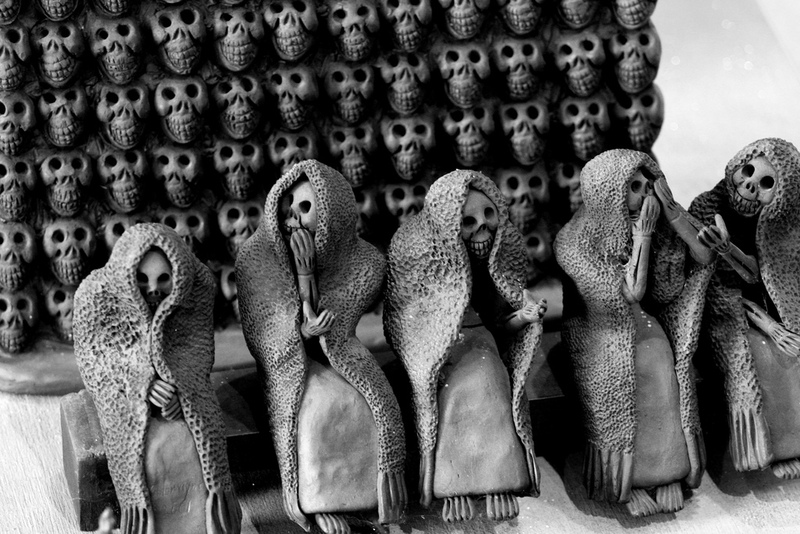 I travelled round Mexico many years ago, but not at this time of year, so I love reading about the Day of the Dead. Sounds like an amazing experience. 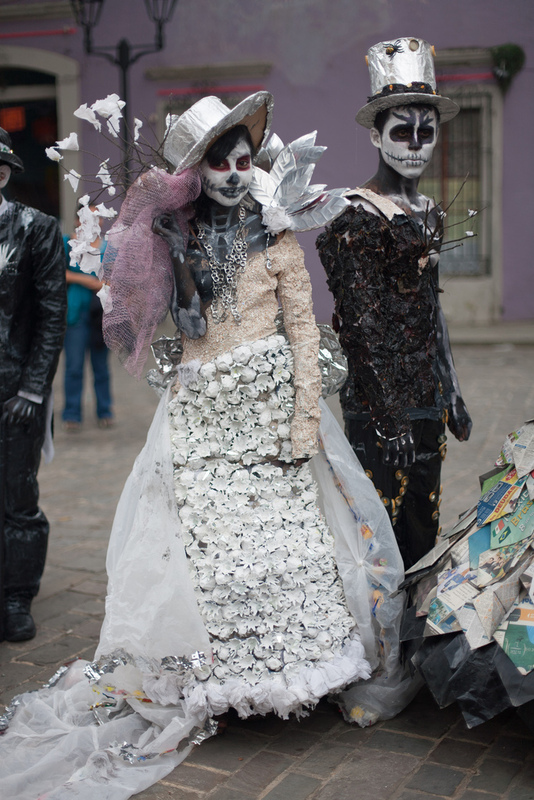 We really loved living in Oaxaca, and Day of the Dead is an incredibly, interesting, complex, and elaborate celebration. Marvelous, really. Thanks for your comments – I really appreciate people taking the time. Cheers! Very interesting cultural information. A must read. Enjoy ! Thanks for the reblog, yiyime! Thanks for the challenge, my good lady.